Roasting an 18-pound bird or massive standing rib roast, making gravy from scratch, and then getting all the sides to the table before they’re ice -cold—these are the magic tricks of the holiday season. But setting the table? That’s a no-brainer. In fact, it’s usually a chore you assign to kids. Still, it’s not quite the cinch it appears to be. If you’re not careful, you could end up creating chaos and leaving your guests with a bad taste in their mouths—and we don’t mean Aunt Edna’s boiled Brussels sprouts. So why not focus on making every little detail right? One important takeaway from entertaining and organizing pros: Tackle the table well ahead of time. “Setting it at least a couple of days in advance is an easy way to check off a box on your to-do list, so you can concentrate on the task without worrying about something burning on the stove,” says celebrity caterer Andrea Correale, founder of Elegant Affairs. Ready to dig in? 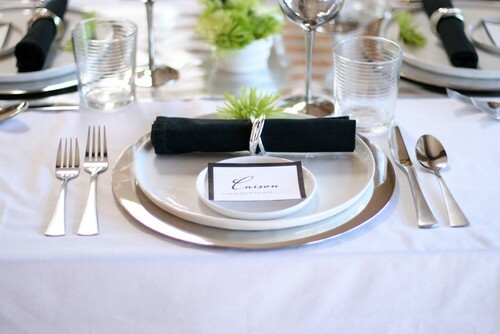 Chew on these mistakes you should avoid at all costs when setting your table for guests. 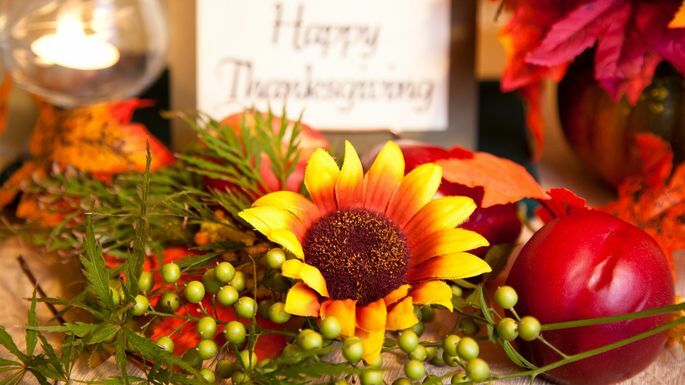 “There’s usually no room for flowers on the Thanksgiving table,” says Julie Corracio, the organizing pro at Reawaken Your Brilliance. Plus, an overly large arrangement blocks guests’ view, causing neck strain as they try to see around the mums. Can’t live without posies? “Put them on the buffet,” she says. As with flowers, there’s really no room at the table for family-style serving. “It creates too much confusion,” Correale cautions. Instead, put the dinner plates on a side buffet or the kitchen island, along with all the food, and allow guests to serve themselves. “It’s much smoother and stress-free,” she says. A couple of skinny tapers? Yes, please. Fat pillar candles or a huge candelabra? Save these for the side board or fireplace mantel. A low row of votives or tea lights in small glass jars emit just enough light without blocking the view or cluttering your table. And whatever you do, nix overly fragrant candles for this occasion. 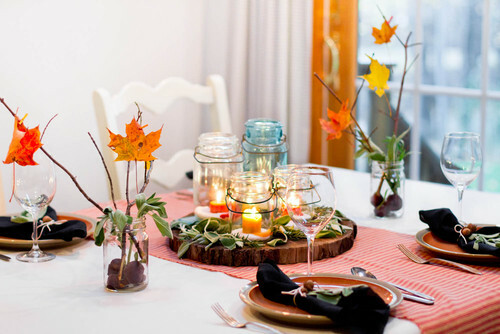 Too much fabric means you could tangle guests or risk someone yanking your tablecloth, which could send the sweet potatoes flying. A tablecloth with a 10- to 15-inch drop is ideal, and always use a pad underneath it to protect from damaging spills, Novak advises. And a word on napkins: break out the cloth ones, rather than flimsy paper—a special meal deserves the real deal. 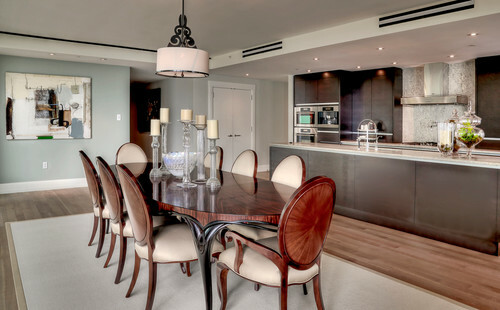 “Some homeowners use their dining chairs and then add folding chairs to accommodate extra guests, but often people feel squished,” Correale says. Instead, borrow smaller seats from a neighbor or friend or rent elegant Chiavari chairs to fill in. 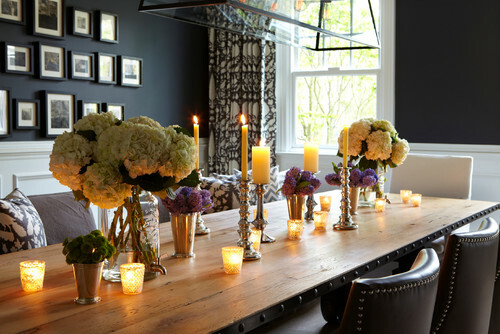 “The table will look stylish and guests will have more room, which will lead to a better experience,” she says. You never feel sillier than when you’re trying to balance a full plate of food and a glass of wine while circling the table, unsure of where to sit. The fix: Make place cards—or have the kids do it (they’ll love this important job). And arrange thoughtful seating to promote new conversations, with young people mixed in with old, and married couples split up. You can bet your guests are eyeing that gravy boat as it wends its way around the table. The same goes for the cranberry sauce, the mustard for your holiday ham, and the butter dish. Rather than have people wait (and panic when the sauce boat runs dry), place at least two gravies, butters, and other condiment bowls on the table. One of the biggest table setting mistakes people make at the holidays is not sitting down for a preview, Novak says. Try it out so you can gauge things for yourself.